Following his recent selfish jibe at Steve Waugh, former Australian spinner Shane Warne is back in the news. However, this time, it was the spin maestro who turned out to be at the receiving end. The former Oz cricketer suffered a snakebite after he dipped his head into a box full of reptiles. No, Warne was not drunk and he hasn't lost his mind. The 46-year-old was asked to take the challenge as part of the reality show "I'm A Celebrity...Get Me Out Of Here!". 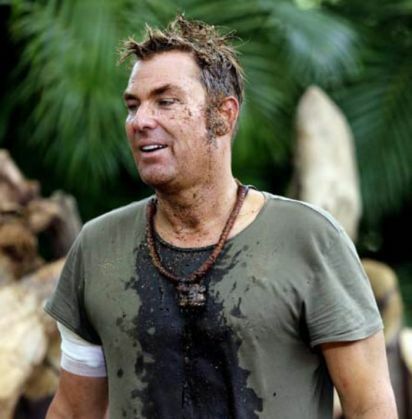 A promo clip for the Network Ten show shows Warne getting the snakebite on his head by none other than the vicious anaconda. "The juvenile anaconda is the one that actually struck Shane," a Network Ten spokesperson told the news.com.au website. "It's non-venomous but very aggressive. Anacondas have 100 rear-facing teeth. Being bitten by one is like getting 100 hypodermic needles at once," the spokesperson added. According to the Daily Telegraph, Warne received treatment from medics on the strike area and though he has some small marks from the bite, there will be no permanent scarring. "Shane has made no secret that snakes are one of his greatest fears, so it's amazing that after being bitten he bravely continued with the trial. When Shane puts his mind to a task, he won't let anything stop him," executive producer Stephen Tate told the Daily Telegraph.